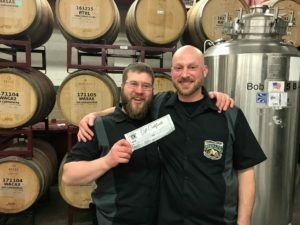 Steve and Fox representing the MLBA with a 1st place finish at the Barrel Brew! Welcome to the Main Line Brewers Association! We’re glad you have decided to stop by. Please feel free to contact us (info@mainlinebrewers.com) or, better yet, attend one of our monthly meetings at the Iron Hill in Ardmore, PA.